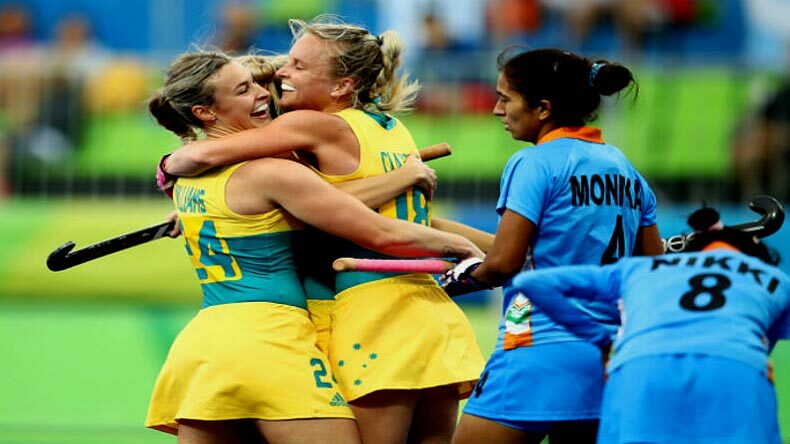 The women-in-blue put up a good fight but it just wasn't their day Australia thrashed India 1-0 to move into the final. Even after putting up a splendid performance in the last 10 minutes, India couldn't score a goal as chances went begging. They'll now face England in the bronze medal match on Saturday. The Indian women’s hockey team went up against the mighty Australians in the 2nd semi-final and they fought valiantly, but lost 1-0, in what proved to be a thrilling encounter between two very good sides. The Rani Rampal led side put up a brave show and gave a tough fight to the Aussies in a match which saw no goal being scored for the first 36 minutes. The team still has a chance to win a medal for their country as they clash with England in the bronze medal playoff on Saturday. The match started with the Australians dominating the play. They managed to get a couple of penalty corners in just the 5th minute but failed to convert them, as India lost their video referral too. India managed only one shot at the goal in the first quarter, coming from the skipper herself. The attacking mindset of India was pretty clear from the start, making a statement for themselves in this match. But the scoreline remained the same at 0-0 as the first quarter was up. Australia then came out attacking with Jane Claxton having a brilliant shot at the goal in the 16” but only to be saved by goalie Savita courtesy a full-length stretch. India then lost one of her players Navneet kaur as she was given a yellow card one minute later. Reduced to just 10 on the field, India somehow managed to get past the second quarter as Australia looked very erratic and frantic in their approach, giving up the possession if the ball too easily on numerous occasions. In the 26”, Gabrielle Nance got a green card too. At halftime, the scoreline again read: 0-0. The Aussies then came out all guns blazing. They played aggressively right from the start and made their intent very clear – that they were here to win. They got a penalty corner in the 32” but Jodie Kenny failed to convert. Emily Hurtz, who was playing her 100th match passed one to Grace Stewart off a long hop, who then thrashed it past Savita’s shoulders. And there it was. The first goal of the match, coming in the 37th minute saw Australia take a 1-0 lead. The goal buoyed the Australian spirits as they made a solid comeback, after being a bit off in the first half. Captain rani then got a green card, and India clearly looked under the pump. Australia completely dominated the third quarter but India somehow got past it. The umpires blew the whistle for the fourth and final quarter. India’s intent was clear. They were there to equalize Australia’s lead. India earned back-to-back penalty corners in the fourth quarter but squandered both as the opportunity to score an equalizer went begging. They got another penalty corner but could not utilize that also. India’s coach Harendra Singh recalled goalkeeper Savita Punia when only four minutes were left in the match but his players could not cash in on the chances that came their way. Navneet Kaur missed out on a sitter from a Monika Malik cross from the right flank while captain Rani Rampal could not slam in a through pass from Vandana Kataria. Despite the desperation and all the efforts put in, Indian eves couldn’t score. But they put up a good fight in the fourth quarter. They were clearly the better side in the last few minutes, but alas it wasn’t their day as Australia were through to the finals. They’ll now face neighbors new Zealand in the gold medal clash, while India will go up against England for the third-place playoff.